The Department of Defense announced today the death of two soldiers who were supporting Operation Iraqi Freedom. They died August 15, 2007, in Taji, Iraq, when the enemy attacked using indirect fire. Sergeant Princess C. Samuels, 22, of Mitchellville, Maryland. The soldier was assigned to Headquarters and Headquarters Troop, 1st Brigade Combat Team, 1st Cavalry Division, Fort Hood, Texas. Specialist Zandra T. Walker, 28, of Greenville, South Carolina. The soldier was assigned to 4th Battalion, 227th Aviation Regiment, 1st Aviation Cavalry Brigade, 1st Cavalry Division, Fort Hood, Texas. For more information related to this release, the media may contact the Fort Hood public affairs office at (254) 287-9993; after hours (254) 291-2591. 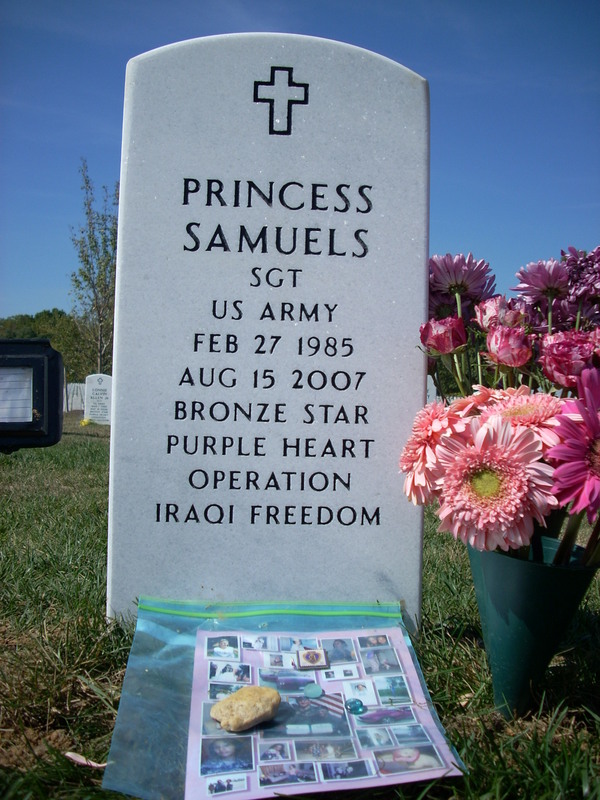 Army Sergeant Princess C. Samuels was a girly girl. She was a cheerleader in high school. She had a white poodle named Skylar whose ears and tail she had dyed pink. She had her Mustang custom painted pink and purple to match a Barbie car she owned as a child. She loved fashion, especially pink clothes. Skylar and some of those pink clothes will be on hand next week when Samuels, 22, one of the latest casualties of the war in Iraq, is buried at Arlington National Cemetery. A graduate of Charles H. Flowers High School in Springdale, where she was in ROTC, Samuels, of Mitchellville, was killed by enemy fire Wednesday in Taji, Iraq. She was stationed there as an intelligence officer with Headquarters and Headquarters Troop, 1st Brigade Combat Team, 1st Cavalry Division, according to a Defense Department statement. "I am very upset that this has happened," Samuels's distraught mother, Anika Lawal of Waldorf, said yesterday. "I want to know why I'm planning a funeral while George Bush is planning a wedding." Lawal was among a number of relatives and friends mourning the loss of Samuels, who died along with another female soldier, Zandra T. Walker, 28, of Greenville, South Carolina, the release said. Walker was with the 4th Battalion, 227th Aviation Regiment, 1st Aviation Cavalry Brigade, 1st Cavalry Division. "She was beautiful," Lawal said of her daughter. "She loved her clothes and makeup. She wanted to be a model, but I was against it. I told her to focus on her brains and to be educated." Instead of heading to college after high school, Samuels enlisted in the Army. She told her mother she wasn't ready for college and wanted to travel. 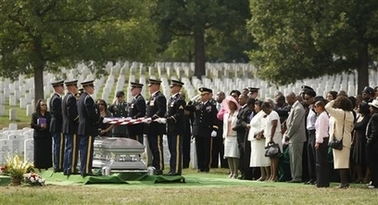 At her home in Waldorf yesterday, Lawal made plans to bury her daughter with full military honors. The funeral is scheduled for August 31, 2007. As she looked at pictures of Samuels, Lawal thought back to the delight in her daughter's voice as they had made plans to get matching tattoos and celebrate Lawal's 80-pound weight loss after gastric bypass surgery. Lawal recalled her surprise when she learned that her daughter had married Victor Jones, a former soldier who lives in Bowie. She said her daughter was terrified to be in Iraq and planned to leave the military as soon as she could. Lawal also said her daughter was not cut out to be a soldier and tried to hide her fear during their telephone calls, including their last one, on Aug. 6, when Samuels called to wish her mother a happy birthday. "She was just like the other soldiers," Lawal said. "They can't come out and say it because they will get in trouble, but many of them don't believe in this mission. She didn't." Lawal said her daughter had been ill for months and had been prescribed a medicine to treat depression and stimulate her appetite. She was losing weight. She had been sick, but they still would not send my child home," Lawal said. "She told me they were overworked, that she sometimes worked 12 hours a day, seven days a week." Carla Lee, 25, Samuels's roommate at Fort Hood, Tex., said she plans to bring Samuels's beloved Skylar to Maryland for the funeral. She is also planning to bring the loads of pink clothes that line Samuels's closet. "She loved pink," she said. "All of her clothes were pink." Even in Iraq, Samuels did not abandon her love of fashion. She went online to order from Victoria's Secret. Lee said she received a call from Samuels the day she died. "She was a very friendly person," said Anice Hagler, 21, who was on the Flowers cheerleading squad with Samuels. "She was funny and a lot of fun to be around." 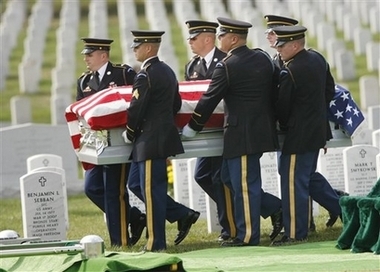 A military funeral is scheduled August 31, 2007, at Arlington National Cemetery for a Landover woman killed while serving in Iraq last week. 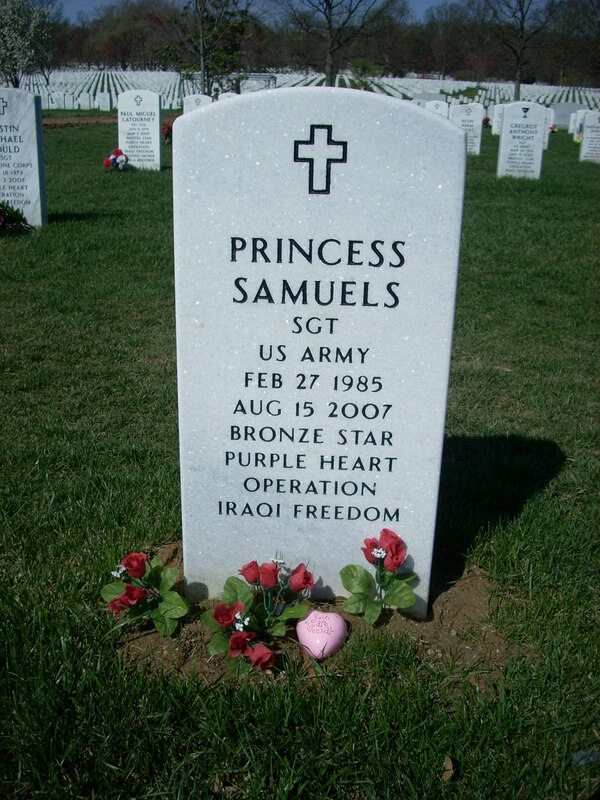 Sergeant Princess C. Samuels, 22, was killed August 15, 2007, in Taji, Iraq, located about 50 miles north of Baghdad. Another woman, Zandra T. Walker, of Greenville, South Carolina, was also killed in the attack, according to Pentagon officials. Samuels, who had served in the U.S. Army since 2004, was a graduate of Charles Flowers High School in Springdale, where she served in the ROTC. The couple, who met in high school, married in April 2006. Nicknamed ‘‘Noodle” because of her thin frame, Samuels joined the Army in 2004, following in Jones’ footsteps. She had been assigned to the 1st Cavalry Division based in Fort Hood, Texas, where she worked with the U.S. Border Patrol before being stationed in Iraq, her husband said. She later became an imagery specialist in military intelligence. Off-duty, Samuels lived up to her first name. Friends and family said the 22-year-old sported a wardrobe full of pink clothing and had a pet poodle in Texas whose ears she dyed pink. A Department of Defense statement reported that Samuels was killed by ‘‘indirect” enemy fire. Officials would not elaborate. Former friends joined together online this week, where a group was formed on the social networking Web site Facebook.com to honor her memory. ‘‘What’s a prince, with no Princess Samuels?” was the title Jones chose for the group. He said friends have come together to support each other. Anika Lawal pursed her lips yesterday when an Army general read the list of honors that had been awarded posthumously to her daughter, Sergeant Princess Crystal-Dawn Samuels. She shook visibly as he took her hand, walked her to Samuels's silver coffin and asked her to place the medals atop the flag draped there. But the sorrow she and her family expressed as they gathered for a funeral service at Jericho City of Praise Church in Landover and later a burial at Arlington National Ceremony soon gave way to anger. "This is a total waste -- a total waste," said the soldier's grandfather, Steve Samuels Sr., looking at the coffin as it sat on plot number 8719 in section 60 of the cemetery. "She shouldn't have been over there. We've got young folks dying fighting a war that they know nothing about. They are not defending a country -- they are being used as pawns." Lawal, who said she plans to use her daughter's death as a platform to argue against the war, wept openly as a three-gun salute was fired and taps was played on a bugle in the distance. Samuels, 22, the "girly girl" from Mitchellville with the pink-and-white poodle and the purple-and-pink car, was buried with full military honors. 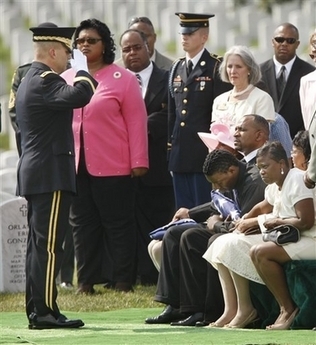 Samuels's husband, Victor Jones, a former soldier who lives in Bowie, rocked and stared straight ahead at the ceremony at Arlington, occasionally wiping his cheek to remove a tear. 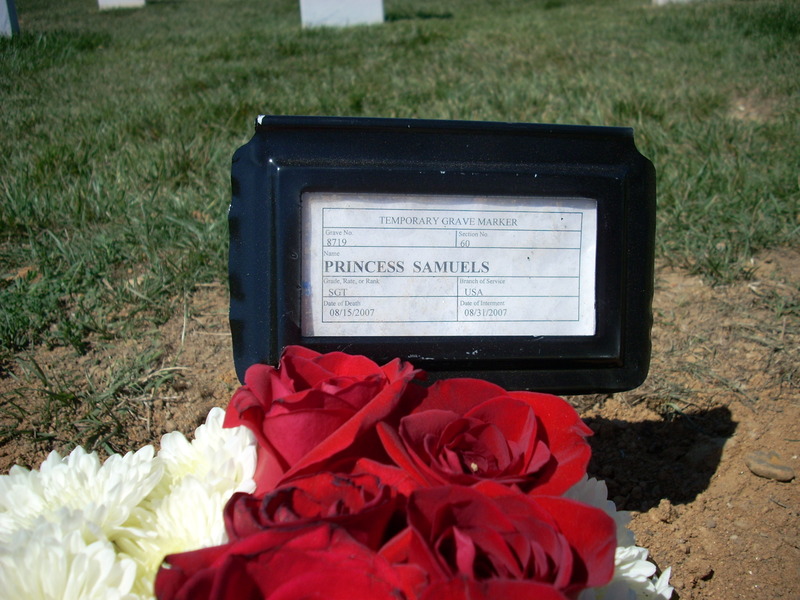 Samuels, a graduate of Charles H. Flowers High School in Springdale, was working as an intelligence officer with Headquarters and Headquarters Troop, 1st Brigade Combat Team, 1st Cavalry Division, in Taji, Iraq, when she was killed by enemy fire August 15, 2007, according to a Defense Department statement. She had been in Iraq since February, relatives said, and was so afraid that her health had started to fail. Lawal said Samuels had been treated for depression and weight loss but had not been able to return home. Before the military ceremony at Arlington yesterday, loved ones, acquaintances and colleagues from Fort Hood, Tex., gathered at Jericho City of Praise to celebrate Samuels's life. Lawal, in a cream suit with a pink hat in honor of daughter, was in tears as she filed past a large photo of Samuels in an elegant pose. She wailed as she walked toward the flag-draped coffin where her only daughter lay in her Army dress uniform. Mourners included Prince George's County Council member David Harrington (D-Cheverly), County Executive Jack B. Johnson (D) and U.S. Rep. Albert R. Wynn (D-Md. ), who was accompanied by his wife, Gaines, who taught Samuels art at Flowers High. Before approaching the family to offer condolences, Johnson stood in the back of the sanctuary looking at Samuels's photo. "I'm just disgusted, personally disgusted, beyond words about what is going on in Iraq and seeing all these beautiful young people die," Johnson said in an interview. "It's even [worse] because the president has never defined a national security reason for us being over there. . . . For him to continue to send our young men and women over there supposedly to establish a democracy is a falsehood." Speakers told stories about how Samuels wanted to be a fashion designer and how she would design outfits from pieces she ripped off items in her closet. Gaines Wynn told the mourners how Samuels loved to paint with watercolors and had written her that she was painting while in boot camp in Fort Huachuca, Ariz., in the middle of the desert. "Only Princess could have found something to paint in Fort Huachuca," she said, laughing through tears. Later she recalled in an interview how surprised she was to learn that her art student had enlisted in the Army. She said Samuels went on a high-calorie diet, including ice cream and milkshakes, to gain enough weight to qualify for service. During the eulogy, the Rev. Joel R. Peebles Sr. urged the mourners to be joyful and not sad. "Family, know that is not a death," Peebles said directly looking at Lawal. "The Bible says those who believe don't die. This is simply a crossover moment." 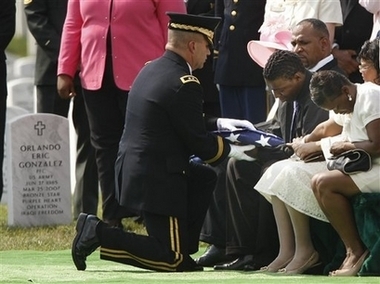 Lawal nodded and smiled, comforted by the message, then headed to Arlington to bury her only daughter.